FRESNO (KMJ) — Staff at Fresno Chaffee Zoo have started work to figure out why African elephant Bets passed away over the weekend. The 11 year-old’s health declined rapidly following a wellness check on Friday, when she was described as having abnormal behavior. On Saturday, Bets’ health deteriorated further and she died Saturday evening. Bets arrived in Fresno in May 2015. In June 2017, zoo CEO Scott Barton shared with KMJ News plans to breed he during her stay in the African Adventure exhibit space. Barton described “exciting behavior” between her and Vus’Musi, which led staff to believe that a successful breeding could be coming in the future. 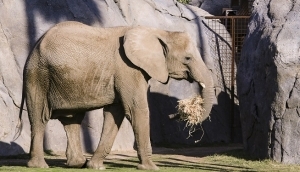 In a statement, Barton said that the zoo is extremely saddened by the elephant’s death.